- TURQUIE : Stratoniceia - An ancient site in the southwestern province of Muğla is believed to be the land where gladiators lived after they retired. Excavations carried out in Muğla’s Yatağan district uncovered the city of Stratoniceia, where the largest gymnasium in Anatolia and a graveyard for gladiators are located. 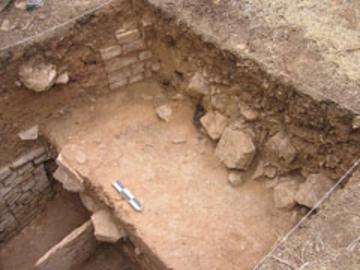 The excavation is expected to shed light on gladiator fights from about 1,800 years ago. “We believe that gladiators retired and lived in Stratoniceia. As much as it is a city of marble, Stratoniceia is also a city of gladiators,” excavation head told. It has many aspects that distinguish it from other ancient sites, including the gymnasium and the fact that the city was one of gladiators. A necropolis including tombs of gladiators was uncovered in the northern part of the city. “The gravestones found there are on display at the Muğla Museum. Among them are very famous gladiators, including Droseros, who was killed by Akhilleus, as well as Vitalius, Eumelus, Amaraios, Khrysopteros and Khrysos. Droseros had 17 victories, losing to Akhilleus in the end,” Söğüt explained. Nowhere else in Anatolia is home to this many gladiator gravestones, he said. More gladiator gravestones are expected to be uncovered during the ongoing excavation. “We hope to discover more gladiator names in the coming years. We will have a clearer picture of the area in the future. We will discover more items here,” Söğüt said. - BELGIQUE : Mons - Des ossements provenant de deux squelettes ont été découverts vendredi à Mons dans le cadre de travaux d'aménagement d'un immeuble à la rue Masquelier. Après l'intervention de la DVI (Disaster Victim Identification Team) et d'un médecin légiste, il s'est avéré qu'il s'agissait de squelettes datant des XIVe-XVe siècles. Le service d'archéologie de la ville est également intervenu sur place. La découverte des ossements est certainement explicable par la présence d'un ancien hôpital ou d'un ancien monastère à cet endroit. - INDE : Kurukhsetra - A rare 1200-year-old sandstone sculpture of a Hindu goddess has been discovered from an archeological site near Kaleshwar temple in Kurukhsetra. According to historians, the sculpture signifies the prevalence of worship of female gods during the Pratihar and pre-Pratihar era. The 30 kg sandstone sculpture of goddess Shakti could be from the Shakti peetha of Savitri or the Bhadrakali of Thanesar in Kurukshetra. Thanesar is known for Shaktism, a term which is based on worship of the divine in the form of the supreme mother of the universe. The sculpture was excavated from Harsha-ka-tila an archeological site of historical significance. Thanesar region was the capital of king Harshavardhan in the pre-Pratihar times. 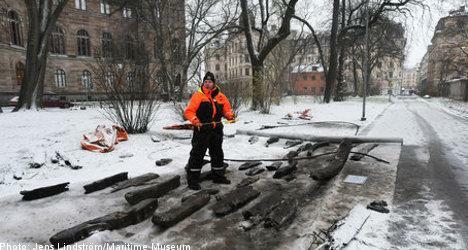 - SUEDE : Stockholm - The remains of a ship dating from the 1600s have been discovered outside the Grand Hotel in central Stockholm. The vessel was built with an almost completely unknown technology, delighting archaeologists. The planks of the ship are not nailed down, but sewn together with rope. The discovery was made by labourers close to the royal palace and in front of Stockholm's Grand Hotel during renovation works to a quay. "The discovery of the wreck is extremely interesting given the place where it was made. There was a naval shipyard on this spot until the start of the 17th century," Maritime Museum director Hans-Lennarth Ohlsson said in a statement. With the exception of another ship found in 1896, all other shipwrecks uncovered in and around the Stockholm harbour have featured planks that were nailed together. "We really know nothing about this technique other than that it was used in the east," added Hansson. Hansson guesses that the ship is from east of the Baltics, possibly from Russia. The ship's position, well into the quay, reveals that it is from the 1600s or earlier. The wreck was not necessarily linked to the yard, however, and archaeologists have been unable to say how long before 1700 it might have sunk. - INDE : Nagapattinam - A five feet high burial urn dating to the Megalithic period (300 BC to 100 AD) and containing teeth and some other articles was unearthed by construction workers at a village near here today. The urn was found at a depth of about eight feet at the backyard of a house at Thillayadi village and contained pieces of teeth and some articles commonly used by soldiers, officials said. Speaking to reporters after visiting the spot, Tarangambadi Archaeological Curator Muthusamy said the urn was four feet wide, with a 2.5 foot diameter mouth. 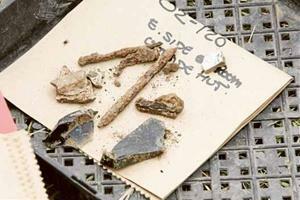 Two small pots, black and red in colour, a few mud plates, cups and pieces of teeth were found in it, he said. Muthusamy said soldiers were usually buried with their belongings in urns during the Megalithic period. "Taking into account the shape, colour and other aspects of the urn, it appears to belong to the Megalithic period. In this particular urn a high ranking soldier might have been buried," he said. - ROYAUME-UNI : Ecosse - Forth crossing - Similar finds have been unearthed but are rare in lowland Scotland and it should give a snapshot of how the land was used 4000 years ago. Trial trenches have been dug across a field on the outskirts of South Queensferry on land reserved for the new crossing. Further excavations are needed to confirm the archaeologists' theory that what they have come across is an early version of a croft, or a small farm. Among the items dug up so far are bits of neolithic pottery, clearly decorated with patterns, as well as a flint arrowhead. The team also believe they have found the remains of a circular house, but plan to carry out further work to establish exactly what it is. Dr Noel Fojut, head of archaeology programmes, said it was no Skara Brae — the prehistoric village in Orkney — but it was still important. "What we have got are one or two locations where there is quite interesting archaeology, but it's quite a limited area." He added, "If the area had been littered with incredibly important archaeology it would have been a bit of a problem for the road builders." The team from Edinburgh-based Headland Archaeology (UK) Ltd carried out a geophysical survey of the field before the trenches were dug. It has been on site for about four weeks and hopes to be have the work completed by Christmas. - AZERBAIDJAN : Ganja - Officials of the Institute of Archaeology and Ethnography of the National Academy of Science of Azerbaijan revealed unique archaeological findings, related to the antique period, in the territory of ancient Ganja. According to the news service of the National Academy of Science of Azerbaijan, in particular, numerous decorations, household objects, coins (similar to those, made during Macedonian Alexander’s reign) related to the antique period were discovered, in particular. At the same time, the territory of ancient Ganja was definite by archaeologists. This territory is located on the right bank of the Ganja river, where the Imamzade complex is currently functioning. All archaeological objects found during the digs in the upper layers of land, were passed to the due instances for conduction of detailed expertise. - AUSTRALIE - A ‘‘rare example’’ of an 1820s-style cottage occupied by convict workers at Belgenny Farm has been found in the same week many gathered to celebrate the anniversary of Governor Lachlan Macquarie’s visit to the site 200 years earlier. Archaeologist Ted Higginbotham said he expected the cottage to be a typical 1820s-style, two-bedroom convict hut, but soon discovered a third room. ‘‘We’ve got another room tacked on beside the two-room structure so what we then have is two conjoined cottages, which is quite rare,’’ he said. "The building would have been occupied by convicts in the 1820s and then later by estate workers and their families." - U.S.A. : Wolf Creek - The seeds of Wolf Creek Indian Village and Museum were sewn in May 1970, when highway construction crews encountered a Native American village. The village was last occupied at about the same time as the English gentry cornered King John of England at Runnymede and forced him into making concessions in the Magna Carta. As a result, the native peoples who lived in the region that would become Bland County, Va., more than 240 years after the Pilgrims landed at Plymouth Rock, were long gone when European colonists arrived. During the past two weekends, some of Virginia’s top archaeologists visited Bland County to re-examine the topsoil that was removed to get to the circa 1215 settlement. - GEORGIE : Dzalisa - The Georgian National Museum (GNM) presented the Dzalisa Archeological Site Rehabilitation Project. Excavations at Dzalisa, according to Lortkipanidze were launched under Professor Alexander Bokhochadze’s leadership in 1970s. Thus the new generations have to develop their new looks through the scientific projects. It will take the joint team of Georgian and Italian analysts and students to find the way to clean the faded mosaics and restore all of its 12 colours. “The unique archaeological site has the remains of a Roman villa dating back to the II-IV centuries A.D. A mosaic of Dionysus – the Greek god of wine and his wife Ariadne, highlights the ancient culture of winemaking in Georgia,” BP Cultural Heritage Adviser Nino Erkomaishvili told The Messenger adding that the project which began this year will be completed by 2011. It is extremely extraordinary to find examples of ancient remains of the Roman Empire in Georgia. - CHINE : Harvard Professor Rowan Flad is an associate professor of anthropological archaeology working in China. His research is currently focused on the emergence and development of complex society during the late Neolithic period and the Bronze Age in China. This research incorporates interests in diachronic change in production processes, the intersection between ritual activity and production, the role of animals in early Chinese society - particularly their use in sacrifice and divination, and the processes involved in social change in general. Recently he has conducted excavations at a salt production site in the eastern Sichuan Basin and has started a new field project in the Chengdu region focusing on prehistoric settlement patterns and social evolution in that region. - U.S.A. : Snowmass village - Extinct mammals have been oozing from the peat and clay up at Snowmass Village. Names like ground sloth, mammoths, mastodons, and a huge bison have replaced turkeys on menus for diners up there with a zest for paleontology and a zany sense of humor. Perhaps 130,000 years ago, Ice Age megafauna and other extinct creatures were chomping at the salad bar, where a world-class discovery in mid-October immediately sent paleontologists, archaeologists, geologists, biologists, zoologists, ecologists, and climatologists on an uphill race against Old Man Winter at Snowmass. Our state’s first discovery of a Jefferson ground sloth is probably the most surprising find among all the other amazing beasts and bones that have been uncovered. A bison with horns twice the length of a present-day bison’s has gotten its share of attention, too, among the other species that were extinct long before ancient humans first left their footprints in Colorado.The site is one of the most important and most exciting discoveries in the entire Rocky Mountains. Picking up the thread much later, but still early, at the tag end of the Ice Age a little over 10,000 years ago, our own area had its learning opportunity when a higher site was found north of Creede. In the 1990s, this Folsom site was discovered on Black Mountain, at 10,160 feet above sea level. By then, humans were hunting for meat at a surprisingly high elevation. We can imagine in the mind’s eye the scene on Black Mountain when an Ice Age hunter with an atlatl killed a prey, possibly a deer, and the women skinned the animal and cooked and dried strips of meat to carry on their journey. The San Luis Valley has yielded a few other Folsom sites, especially in the eastern part of Alamosa County, but none others are this high. - VIET-NAM : Saigon - Sai Gon is generally considered to be a new city about 300 years old. However, some vestiges show that Sai Gon was once a commercial port in the early Christian Era. For more than 2000 years, Sai Gon has always kept its central position and played a key role in the development of southern Viet Nam. Though only a few vestiges have been excavated, they are important links in a chain that connects a city of 2000 years ago with its present. Archaeological relics in HCM City also prove the city to be one on the road to the Oc Eo Civilization (Oc Eo appeared and occupied large areas of present-day South Viet Nam and Cambodia from the 1st to the 6th century A.D, forming important centers of trade with sea-links reaching as far as Rome, Persia, India, Burma, and China). From a historical standpoint, the Sai Gon commercial port provides evidence that the city's history stretches much further back than usually assumed. There are only a few of the physical traces that reflect the cultural history of the area. Architectural art relics are mostly religious buildings that were mainly built of wood hundreds of years ago. Many of them are in very bad conditions. In comparison with the capital of Ha Noi and the ancient capital of Hue, these kind of relics in HCM City are fewer and younger. The specific architectural and decorative characteristics show a diverse cultural exchange that took place over the years. The system of sepulchres in HCM City is also typical of these kinds of relics in South Viet Nam. Though some of them were excavated, they have not, on the whole, been given proper attention. The urbanisation process is a direct threat to this relic. The relics of the 300-year-old Sai Gon are buildings, factories, and equipment dating back to the 19th century.